This is what I was planning to do at a later phase of my life. Vedanta and Samkhya have merged with Dwait philosophy, Advait is flourishing very well, however, the other schools are dead. If you want to do anything for the Brahminic system (which as you point out is scholarly), revive them. I am deciding between Nyaya and Vaisheshika. I would highly suggest picking one system that you feel comfortable with and learn more about it. These schools cannot be dead or remain dead. I intend to eventually modernize vedic thought with scientific methodology and findings just like how the Upanishads did with the Ved - but prior to that, the schools must be revived. Out of the 6 known dharm shashtras, which one do you follow and why? These are questions that the younger Brahmins should know - not all this reservation and whatnot. Brahmins of India go on and on about things that don't really matter, such as politics and who does and eats what - but we have lost Sanskrit and have lost 90% of what our ancestors formulated. Everything has gone extinct, we have to revive ideas that are distinct and important identities without denigrating others. So, that's what I suggest you do - pick a school and use all your time and resources to revive it. Don't focus on politics/reservations and all that. Be scholarly. Don't adopt these ideas of superiority and inferiority - because these ideas give you a false sense of comfort, Vinash Kale Viprit Buddhi. Be humble, forthcoming, honest and devoid yourself of taking any side - if you are a Brahmin, you will always remain neutral. A Brahmin is expected to always remain neutral, calm, focused and peaceful. My view is Brahmins should focus on what they have been doing in history - philosophy, science, maths and all that - since modern standards are available, we should modernize ourselves and keep up with times - all this caste business and all that, these are toxic ideas. Practice it at home if you have to, even I don a Janev, eat vegetarian and recite Gayatri mantra in the morning - but I don't expect others to do the same. Just because we maintain a certain way of life does not make us superior... your focus should be on the Brahminic system, not the very causes that have destroyed our way of life, since we lost Sanskrit. In Nepal, we Brahamans are 17% in total population. It would be useful to add Nepalese Brahman in your website. If you like, I can send you information about. I have a couple of major complaints with your commnets on Brahmins of South India. 1. You acknowledge ONLY Iyers and Iyengars and mention that they are anti-hindi. FYI, It is the anti-Brahmin tamil poets/artists/activists that are usually anti-Hindi. The Iyers that I have met have no such prejudices. 2. You have totally omitted the great Madhva Sangha Brahmin belt and the Daasa tradition that originates in Karnataka. Read up on Madhvacharya and the 8 major schools(Matts) near Udupi. The names Rao, Bharadwaj, Kashyap. Dikshit, Acharya, Aachar, Hegde, Swamy are used by Brahmins from this Madhva belt. It has been a tradition to use initials instead Brahmin surnames. I am a "Rao", but my Father gave me his initials when I was enrolled to school. 3. Then there are Havyak Brahmins, Konkani Brahmins, Deshasta Brahmins, Smartha Brahmins. As usual Karnataka is grossly misrepresented when you North Indians do your studies. - Please read my article carefully. - I have acknowledged Tamil, Andhra, Kerala, Maharashtrian as well as Karnataka Brahmins. - I have said that many Iyers & Iyengars from TN, are anti-Hindi/ anti-Hindu - not applicable to Iyers/ Iyengars in other place. The Hindu paper is run by anti-Hindu Tam Brams - the major political parties of TN are anti-Hindu and have many Tam Brams in their teams. 2. Thank you for the information. 3. Thank you for the information. "As usual Karnataka is grossly misrepresented when you North Indians do your studies." - There is no need to be rude, uncouth or ill-mannered. 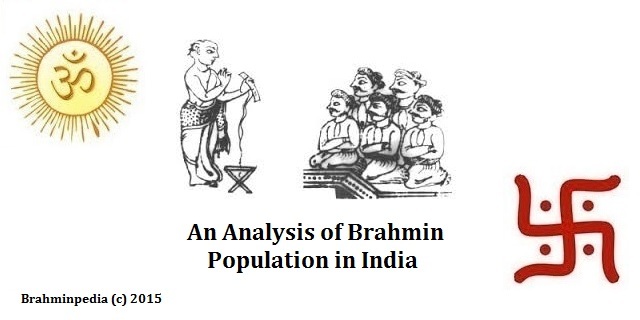 - I am doing this research voluntarily - very few Karnataka Brahmins have sent me any information. - Calling me North Indian shows your ignorance - I am East Indian if you want to know. Kolkata to Delhi is the same distance as Kolkata to Bangalore. A Very elaborative study done by you..really you deserve compliments.. I feel some more titles in Bengali Brahmins can be added up in addition to those which is mentioned. For e.g., Siddhanta; Kahali; Kushari; Ghatak-these are the two titles which I found are Bengali Brahmin. There are some other titles, which can be applicable to many casts like Ray; Chaudhuri. Mazumdar etc. They are already mentioned. Please search within Brahminpedia. i want to know if all Bandopadhyay belongs to the same gotra of Shandilya?? coz all Bahuguna of Uttarakhand belongs to Bandopadhyay family but uses Bhardwaj as their gotra?? is it possible?? kindly help me out? ?